Location : Western Ghats, Karnataka, Southern India. Time to Visit : Between September and March, it is best time to visit Coorg. Weather : Coorg experiences moderate climate with pleasant winters, warm summers and heavy monsoon. Known For : Scenic Beauty. A philosopher's dreamland, Coorg is located on the on the Western Ghats of Karnataka. Its rich flora and fauna has earned this place international recognition. The well preserved biodiversity of this place is a tourist trapper. The maiden mountains and retreating rain forests has been woven very well by mother nature, making it a choicest location. Coorg was originally an English Settlement with rich coffee estates and pepper & cardamom plantations. The enthralling journey to the scenic surrounds of this spots will orient you to the diverse life that inhibits here. A large number of farms and gardens with flowering beauty set in a perfect way and provide a perfect stay for the eco tourists. The Scotland of India lies 252 km off Bangalore and is dense forested steep hill. Misty hills, blinding fog, lush forests, orange grooves and breathtaking views of the valley makes it a perfect eco-tourism destination. The most important of all is Nagarhole National Park which is a treasure trove of exquiste wildlife of Coorg. A number of rivers like Cauvery, originate from this place making river rafting and white water adventure more joyous. Home for fawny black stripped Royal Bengal Tiger, Nagarhole National Park is a biosphere reserve in Nilgiri Hills. Majestic roar of lions and tall standing trees stretches through a series of hills and protected forests. Waters from river Kabini drenches most of the area here and harbors fishes. Besides tigers, Nilgiri tahr, Nilgiri langur, bison, leopard, Asian elephant, wild boar, deer, dhole (wild dog) and porcupines forms the fauna here. Valanoor is situated 30km from Mercara which is the backwaters of Cauvery. This place is a perfect angling destination of Karnataka. Exquisite variety of fishes are found here which are worth a catch. Golden Masheer, Maral amd Maap are few fishes that are found here. Around 6km from the Madikeri Kushlanagar Road is the Harangi Dam. The Harangi river forms a huge reservoir that looks beautiful. It is a nice place for a picnic lunches and leisurely stroll. The elephant training capturing and training camp of Forest department, Durbare, lies on the banks of Krishna river. Dubare is a big bath tub for elephants that rest here in the evening after day's work. This captivating scenic surroundings with an interesting elephant orchestra, lures a large number of tourists. If you are able to impress the local trainer, you can enjoy a free elephant ride or can pay a very nominalamount. Towards south of Coorg, Iruppu is a sacred spot and a bewitching waterfall. These magistic falls are believed to have drop out of a arrow that was shot by Laxmana while searching water for his brother Rama in great Hindu epic, Ramayana. The paddy field that surround this place look picturesque and add to the beauty of this place. One of the famous waterfalls of India, Abbey Falls lies 8km off Medikeri. Water gushing down the rocks looks mesmerizing. There are a few coffee and cardamom plantations around this place which adds to the beauty of this picturesque waterfall. 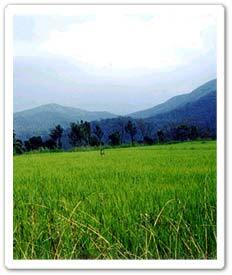 A well known hill station in Coorg, can be an exciting get away destination. There are large number of tourist places in Madikere that dot the region and provide for excellent relaxation amidst scenic surrounds. Raja Seat is a well maintained garden with breathtaking views of the green hills. Abbi Falls, Bhaga Mandala and Tala Kaveri are few other places of Interest that can be visited here. Coorg offers a large number of handicraft items that can be bought as a remembrance of this bewitching place. Hand woven and embroidered clothes with bamboo baskets and jute bags, the shopping list is endless here. The shopping area is located at a very accessible point. You may find different kinds of stone crafted items which can be bought at a very negligible price. 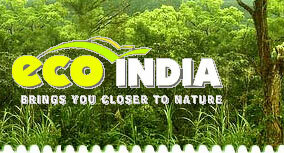 Coorg sets in complete natural surroundings without an inch of railway track or an air base. The only way is through roads. Although you may take flights or board at trains that enroute Mysore. Innumerable state transport buses ply from Coorg or Kadagu at regular intervals. Air : Mysore and Mangalore are the two airports nearest to Coorg. You can take private cabs or coaches that are destined at Coorg. Prepaid taxi centers, run by State Government, are available outside the airport. It is always advisable to fix your price before you start with your journey. Rail : Mysore, Mangalore and Hassan are three railheads that are nearest to Coorg. These railheads are accessible from almost every part of India. Taxis from railway station can be hired to reach Coorg. Road : The lifeline of Coorg, it is the only way you can head this place. Innumerable coaches and cabs are available for the easy commutation for the tourists. Moving Around in Coorg The hilly area of Coorg is full of twisting and turning paths which makes it inaccessible via rail or airways. The only way to move around Coorg is on foot while for long distances, private jeeps can be hired which are available at very nominal charges. A stay at the Rainforest Retreat is an unforgettable experience for eco tourists. It is a beautiful brook-side bungalow, set in thick bamboo, banana, orange and pineapple plantations and conforms to international standards of style and comfort. The hotel has two bedrooms, a spacious living room, sit-out and perhaps the best rain forest loo. A second, more rustic shelter is the Yin-Yang Cottage inside the coffee plantation. This picturesque resort provides ample recreational and relaxation options, amidst the green surroundings of Coorg. These two resorts are choicest for tourists.